I work at Howard University as a adjunct professor for my second job (as if I’m not already busy enough) and I teach Social Media Marketing. I love my students, they are a highlight of my day but I try to give my students a well rounded perspective of the industry and I bring in 4-6 speakers a semester. I’ve got a few repeat presenters who I love and as a thank you I knit them something for coming to my class repeatedly. When I asked my former student Cait (from when I worked in higher ed at American University) what she would want me to knit her since she was coming in last week she told me that instead of something for herself she’d love it if I made her something for her baby on the way! She’s having a boy in June and asked for something navy so I whipped up my favorite pattern, the Baby Sophisticate cardigan. My lighting was slightly off in these pics but I promise you this is the Caron Simply Soft yarn in a lovely deep navy blue. And I was excited because in my button stash were the cutest blue goldfish buttons! I’ve had these for years but hadn’t found the right project for them and I thought this was the one. 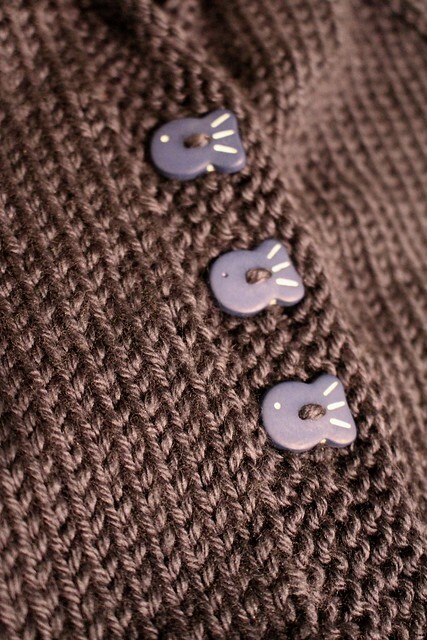 All baby cardigans need fun buttons, right?! Since her son will be born in June I made the 3-6 month size with hopes that this will be a perfect fit for him by the time fall rolls around. I might even need to whip up a hat to match after he gets here. And I am asked often about my gift tags and I made them with my Silhouette Mint Stamp Maker. I love that thing (also they’re always going on sale because I got mine for about $25) but I knew I needed a stamp with instructions and a logo that let you know I made your gift. I have a bunch of blank gift tags and just stamp and check the boxes once I’m finished. Easy peasy. That’s all I’ve got today. Back to resting until I have to drag myself out of bed to teach my class (no sick days for professors). adorable sweater and I hope you feel better soon!!!! Thanks, I’m slowly on the mend. Ugh – so sorry you’ve been sick. A cold that drags on for days can really get you down. Hopefully, Cher and Jelly are helping keep your spirits up. This is a precious sweater! Lucky speaker!! I’m sorry you’re sick. There are little germs everywhere. 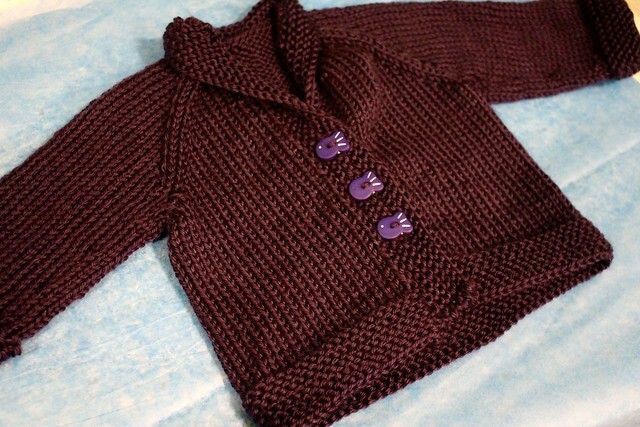 I love this baby boy cardigan. The buttons are so cute. She’s going to love it. She did love it. I can’t wait to see him get to wear it this fall. Thanks, I’m on the mend! I suppose the bonus is that you’re not too sick to knit. Take the time to get better. You’ve got a lot on your plate!